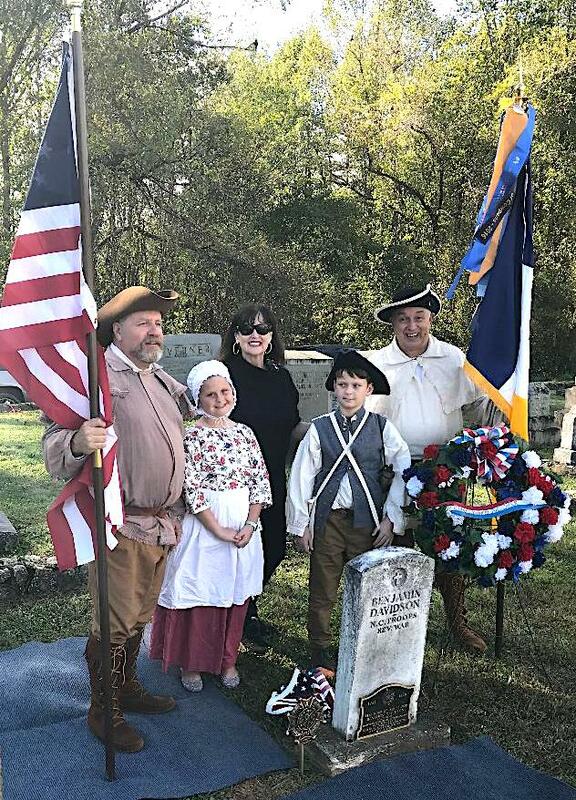 Western North Carolina’s rich historic heritage was remembered on Saturday afternoon, October 13, 2018, when the grave sites of two American Revolution patriots were marked and commemorated by members of the Blue Ridge Chapter of the Sons of the American Revolution and other citizens. The ceremony took place in the Davidson River Cemetery in Transylvania County at the burial sites of Benjamin Davidson and Thomas Patton, both veterans of the war for American independence. The chain of events that began on October 1780 at King’s Mountain and the Cowpens on January 1781 was literally the beginning of the end for the British forces of General Lord Charles Cornwallis. Patriotic victories at these sites followed by heavy losses at Guilford Courthouse in North Carolina during March of 1781 led to the loss of Cornwallis’ entire army at Yorktown, Virginia during the fall of 1781. Both Benjamin Davidson and Thomas Patton were among the cast of the American Patriot forces known as the “Over Mountain Men” who were renowned for their horsemanship, sharp-shooting and overall ruggedness in critical situations. This occasion marked their dedication and desire to create a nation of liberty and freedom that all of us are a part of today. Taking part in the ceremony were members of the National Society of the Sons of the American Revolution-Blue Ridge Chapter, Benjamin Davidson descendent Dianne Roth, members of the Transylvania County Color Guard, and former United States Congressman Charles Taylor.